2nd V.P. Tim Lorman, Calif.
1977-1980: William Kirker, Leslie Walker, Eloise Beach, Fritz Kubisch, W. R. Paylen, Amy Jean Gilmartin, Edgar Smith. 1978-1981: Jeanne Woodbury, Ervin Wurthman, Victoria Padilla, David H. Benzing, Louis Wilson, Joseph F. Carrone, Jr., Timothy A. Calamari, Jr., Roger Vandermeer. Adda Abendroth, Brazil; Luis Ariza Julia, Dominican Republic; Olwen Ferris, Australia; Marcel Lecoufle, France; Harold Martin, New Zealand; Dr. W. Rauh, Germany; Raulino Reitz, Brazil; Walter Richter, Germany; L. B. Smith, USA; R. G. Wilson, Costa Rica; Robert W. Read, USA. Picture on the Cover — Aechmea mulfordii. Photo by courtesy of A. B. Graf. In 1970 Dr. Lyman B. Smith, botanist at the Smithsonian Institution in Washington, D.C., deemed it expedient to reclassify all the species and varieties of the genus Gravisia into the genus Aechmea. Gravisia aquilega thus became Aechmea aquilega, and corresponding changes were made all along the line until Dr. Smith came to Gravisia fosteriana. As there already was an Aechmea fosteriana, he had to find another name for this species, at the same time still honoring Mulford B. Foster, and so the name of Aechmea mulfordii evolved. This is a stunning plant, a native to Brazil where it grows close to the ocean, in low, moist, hot places. For this reason, it is not hardy and will succumb if left outside during a cold winter. It has been difficult to grow in southern California gardens, preferring the protection of the greenhouse. However, if one can give it a warm, protected spot or room under glass, it certainly is worth growing. Beautiful specimens may be seen growing in gardens of Hawaii, as well as in Durban, South Africa, where the photo on the cover was taken. Aechmea mulfordii is a large bromeliad with faintly banded leaves measuring almost three feet in length. The foliage is green with rose overtones, covered with white scales, and edged with dark spines. The inflorescence is about one foot long, and the flowers appear in broad, digitately clustered branchlets. The scape is red; the petals, golden. This aechmea is just one of a number of outstanding bromeliads named for Mulford B. 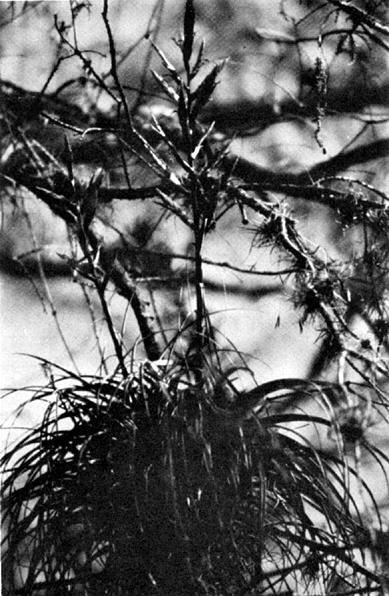 Foster, who, until his death in August, 1978, was the greatest bromeliad collector of his time. These include the genus Fosterella, as well as the following species: Dyckia fosteriana, Guzmania fosteriana, Neoregelia fosteriana. Cryptanthus fosterianus, Vriesea fosteriana, Orthophytum fosterianum, Portea fosteriana, and Billbergia fosteriana. For the great contributions that Mulford B. Foster made to the Bromeliaceae, the reader is referred to the past issues of the Journal, particularly the first ten volumes when he was the editor and more particularly to Volume IV, March-April, 1954, and Volume X, July-August, 1960, in which his achievements are described. Mulford B. 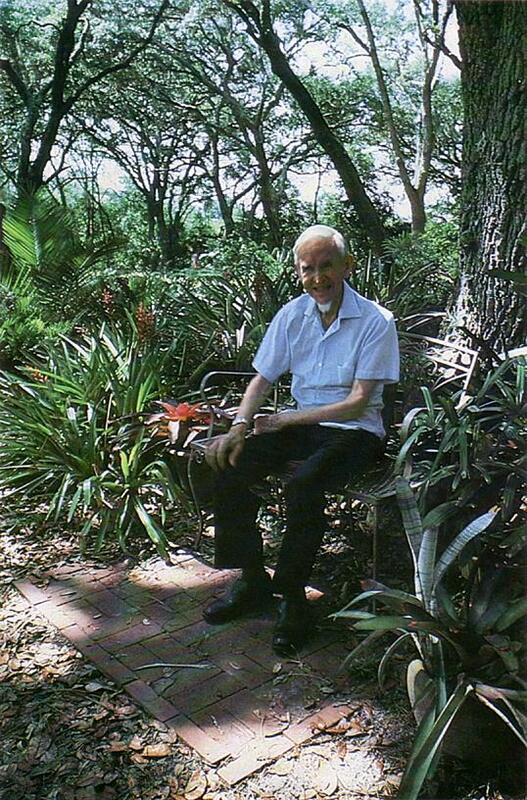 Foster in his garden at Bromel-La, Orlando, Florida. Mulford Foster had already been interested in bromeliads for many years when we met in 1938. Dr. Maxon of the Smithsonian had referred him to me as the only person available on classification and Mulford had looked me up at Harvard's Gray Herbarium. We sat there on the stone steps — it was a Saturday and I could not take a visitor inside — and discussed bromeliads at length. Thus began our partnership in the greatest bromeliad boom ever. Mulford's immediate interest was in gleaning as much advance information as possible about the bromeliads of Dutch Guiana where he proposed to go collecting. I favored eastern Brazil from my own collecting experience and especially southern Bahia where I had recently described some new species from old collections. I finally sold him on the idea and he and Racine went forth to discoveries beyond our wildest dreams. The story of this and their subsequent trip to Brazil in 1940 is well told in their fascinating Brazil, Orchid of the Tropics, unfortunately long out of print — the publisher insisted on the word "Orchids" in the title because he thought it would sell better but he really should not have worried. To be sure they struck it rich but they earned it with the risks and hardships they bore. Mulford's keen vision, agility and ingenuity was backed by Racine's devoted help in the chores of caring for the live plants and making the herbarium specimens. On their return they went through Customs losing many of their treasures to the gas chambers but saving many beautiful species that have made history since. For me the herbarium specimens were an embarrassment of riches and I am afraid I was exasperatingly slow in reporting on them and naming the new species. My working days were wholly occupied with curatorial work and I studied their bromels on evenings, weekends, holidays, and vacations. However, I managed to identify most of the bromels and name many of the new species within a year, although publication lagged. In later years Mulford often reminisced on how I would report five or six new species in longhand on a penny postcard. The next year, before I had started publication of their 1939 finds, Mulford and Racine were off to Brazil again. This time they covered much better known areas than before, but Mulford managed to find new species in places supposedly exhausted by collectors over the past hundred and fifty years. Here Mulford's highly competitive nature stood out when he beat Glaziou's record of new species. Glaziou had collected in the vicinity of Rio for decades in the late nineteenth century and had given rather special attention to bromeliads. Again Mulford recollected a good number of "lost" species. Then the war put a stop to further expeditions and we settled down to work on the bromeliad treasure. Mulford was busy cultivating and popularizing bromels and I describing and illustrating them. We had a steady stream of correspondence and a good number of visits back and forth between Orlando and Cambridge and later Washington. 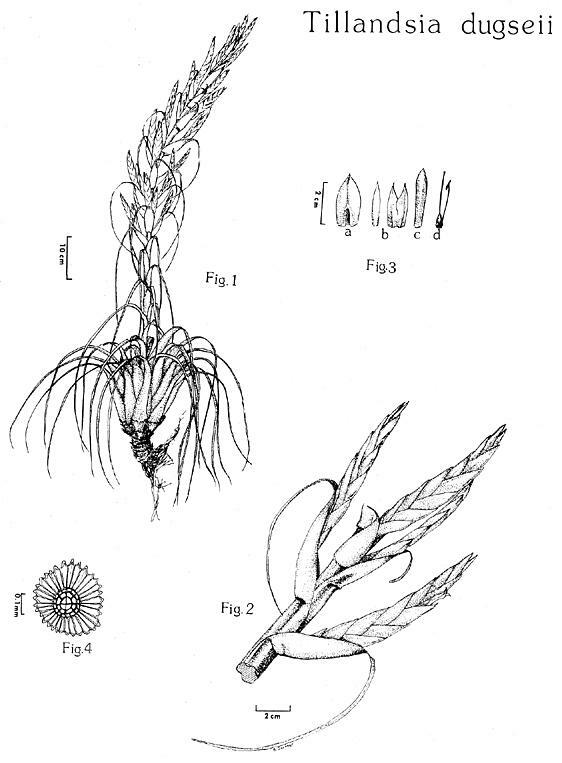 Mulford had the practice of collecting bromels without flowers and cultivating them until they did flower naturally or by chemical treatment. Quite a number turned out to be new. However, not all responded. There was a giant Glomeropitcairnia penduliflora with a rosette so tall that Mulford had to climb a stepladder to look inside. Several times he thought that it was starting to flower but to this day it is vigorously vegetative and stubbornly sterile. Another thorn in the flesh was his numerous and highly variable plants of Billbergia amoena. Time and again they would flower and dash his hopes of another new species. Mulford's love of art was intertwined with his love of plants and has colored our relationship over the years. His ability to observe the form of the living plant and the details of flower structure and record them accurately was invaluable to me in describing and illustrating his new species. Particularly memorable was his discovery of wind borne pollen in Fosterella and of unisexual flowers in Cryptanthus after it had gone unobserved for over a hundred years. However, we were miles apart when it came to color and further still when it came to modern impressionistic art. To Mulford color was all important while I found it a weak and unreliable character in distinguishing species. More than once he ended his defense of a proposed new species with an exasperated: "There's nothing about them that's alike." In many cases we reached a final compromise with his describing the plant as a new variety, which he was better able to do with observation of live material than I with the dried. When I visited Mulford in Orlando he used to enjoy a sweet revenge on my negative attitude. He would take me out to his greenhouse and start showing me his bromels asking me what I thought each one was. Invariably I would fail to recognize one, whereupon he would gleefully exclaim: "Why that's your own species." In 1946 Mulford resumed his bromel hunts with a long trip in Colombia and ultimately visited most of the remaining important bromel areas of Latin America. His finds continued to be impressive as when he added five new species to the eleven of Greigia, but the areas were none of them as rich in total species or in beautiful ornamentals as eastern Brazil. I was never able to go on any of Mulford's big trips but I, and my sons, did have fun and excitement on several Florida visits. Once we waded thigh deep in the Great Cypress Swamp past alligator nests and Mulford captured a huge indigo snake and we found the rare Tillandsia pruinosa. Another time he was taking us to see an otter burrow by Bromel-la and my Steve did not see it in time and stepped on the otter's tail with explosive results. Mulford had the ability of holding an audience of one or a hundred with his stories and humor and of conveying his own enthusiasm. With the founding of the Bromeliad Society in 1950 and his editorship of the Bulletin his audience became worldwide. Julian Nally in his inimitable style has summarized Mulford's achievements (Bromeliad Society Bulletin vol. 10: p. 52-55, 63-64. 1960). Certainly it is the greatest record of bromeliad discovery there has ever been or with the lamentable destruction of tropical forest is ever likely to be. Mulford has his monument in paper and in the beautiful bromeliads that are now being enjoyed the world over. Mulford has asked me, with tongue in cheek, "Where would you have been without me?" and I have answered: "Without your help my work would have been finished much sooner — and also very much poorer." A multitude of people dream of paradise as a place where there is nothing to do, where there is no effort expended, no strife, no bills to pay. If they could suddenly be placed in the center of a great jungle (without any of the inconveniences of getting there) they would look about and see plants growing everywhere quietly and to all appearances serenely poised on tree, limb, and rock or swinging lightly from a branch. "This is paradise!" they would exclaim. Yes, this is a paradise, not because there is nothing to do, however, but because each living thing has worked out its own life cycle through the centuries and although outwardly tranquil, inwardly there is much work going on. The happiness they show is because they have been continually on the alert, have had constant strife in growth and have never rested on their achievements. And when, like the plants, we find ourselves alert, striving to grow, never resting on laurels, we need not search for paradise, we are already there. Foster, Brazil, Orchid of the Tropics. The Northeastern Oklahoma Bromeliad Society, an affiliate of the Bromeliad Society, will hold its annual Bromeliad show on April 7 and 8, 1979, from 12 P.M. to 5 P.M. at the Woodland Hills Mall, 71st and Memorial Drive, Tulsa, Oklahoma. For information contact the show chairman, Cecil C. Waggoner, Rt. 1, Box 239, Morris, Oklahoma, telephone 1-918-733-4602. This is a new group and deserves the support of all bromeliad enthusiasts. We congratulate them for the fine work they are doing. Shortly after I became captivated by bromeliads, an acquaintance told me that I must go meet the "Father of Bromeliads." The thought of meeting such a person was a bit frightening at first, but I soon found myself digging through the phone book looking for that magic number. Thinking back now I realize that it was 8 years ago when I first met Mulford Foster. He was nearly 82 years old and I was only 20! We walked and walked and walked through acres of fascinating bromeliads. He told stories of his many collecting trips and even threw in a few unusual jokes. His enthusiasm was unbelievable. To my surprise we later climbed a stairway leading to the roof of his house and observed some Aechmea distichantha growing there from seed planted by a passing bird. At the end of the day, I was nearly exhausted from all the running around — but Mulford Foster could have gone on and on! He loved to talk about bromeliads. Time and time again I came back to Bromel-la to visit with Mr. Foster and learn all I could about bromeliads. He was a marvelous teacher. Later on I somehow ended up helping him pot bromeliads in his world-famous Bromelario. It was a real treat watching him mix his "secret" potting soil with a pinch of this and a handful of that. My efforts were well rewarded because I would always leave with a bunch of new bromeliads for my ever-expanding collection. Our friendship grew as the years passed and now as I sit thinking about those happy days, I realize how very lucky I was to have known a legend. Good-bye, Mulford Foster, I miss you! The Brazilians call the humming-bird "Beija-flor," the flower kisser, or as we like to say kiss of the flower. There seems to be some affinity between bromeliads and little beija-flores. They both are endemic only to the Americas. They grew up together, possibly each formed for the benefit of the other. The hummers seem to prefer brilliant reds and yellows in their selection of flowers and the bromeliads having much red in many of their inflorescences are indebted particularly to them for pollinization. 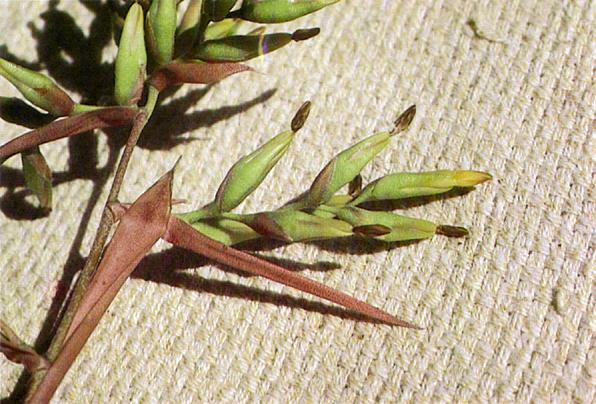 It is rather significant that the humming birds are not only the largest family of birds in the Americas, but in the entire world, and until a single species of bromeliad (Pitcairnia) was reported to have been found in Africa, Bromeliaceae was considered the largest plant family to be found only in the Americas. Persons lucky enough to collect bromeliads in habitat, especially tank epiphytes, will soon discover that bromeliads can fight back. Biting ants, scorpions, mosquitoes, frogs and beetles are common dwellers in the tanks and can make life miserable for collectors. All the more so if the plant is a spiny devil to begin with! The tropical forests in which bromeliads grow are noted for diversity and species richness. This diversity breeds specialized ecological niches which seldom, if ever, go unfilled. Epiphytic tank bromeliads not only occupy some of these niches but create them as well. Animals are quick to take advantage of a drought-free environment where food and shelter are provided and life cycles can be completed in relative safety. Contributions are still being received for this fund which goes to help set up the Mulford B. Foster Bromeliad Identification Center at the Marie Selby Botanical Gardens. Checks may be mailed to the Mulford B. Foster Memorial Fund, 846 North Irma, Orlando, Florida 32803. One of the leading bromeliad growers during the first four decades of this century was Louis Dutrie of Ghent, Belgium, whose famed horticultural establishment at Meirelbeke was the home of some of the most outstanding bromeliads of the era. Unfortunately, the greenhouses with all their choice specimens, upon which Dutrie had built such high hopes, were completely destroyed in World War II, a blow so grievous to the plantsman that it served to hasten his death in 1948. Dutrie was a great hybridist, venturing into fields not hitherto tried. Before him only vrieseas and billbergias had been hybridized to any extent, but thanks to his perspicacity, his patience, and his perseverance he created a number of magnificent hybrids in the genera of Aechmea, Neoregelia, Nidularium, and Guzmania; and something more rare and difficult for his time, he succeeded in obtaining some extremely interesting bigeneric crosses. Because of his ability to produce an abundance of seeds and seedlings, a boon to the commercial horticulturist, Dutrie showed that it was possible to grow bromeliads on a vast scale. It is said that thanks to his valuable hybridizations, Louis Dutrie paved the way for other horticulturists to follow. In 1946 Louis Dutrie wrote "The Bromeliads — Genera, Species, Hybrids" which appeared as a series of ten articles in La Bulletin Horticole, Liege, Belgium, from August, 1946, through January, 1948. Of particular interest to the bromeliad grower today, and especially to those who are endeavoring to produce noteworthy hybrids, are those sections which deal with hybrids. Unlike so many would-be hybridists today, Dutrie kept an accurate record of his successes and failures and a description of the plants he created. Because many of his crosses are being remade, we thought it might be of value to reproduce in the issues of the Journal for the coming year excerpts from those sections dealing with his hybrids and those of his contemporaries. Louis Dutrie was one of the most admired plantsmen of his day. One of his contemporaries wrote of him: "No one is better qualified than our friend to write on bromeliads. Those who have had the good fortune to be admitted to his intimate acquaintances admire him, not only as a good grower, but above all, and especially, as a collector, as an amateur, loving the plants all the more for the pleasure they bring rather than for any material value they may possess." Our thanks go to Bob Burstrom, of Plantation, Florida, for this translation. It is strange that the genus Aechmea, numerous, rich and varied as it is, has been cultivated for such a long time without any attempt at hybridization between the species, while as for the other genera, such as the Billbergia, much less interesting from a commercial viewpoint, they have been the object of numerous crossings. Must this abstention be attributed to the difficulty in obtaining seeds of certain species such as those of A. fulgens and A. fulgens discolor so that several growers have given up the attempt to pollinate them after many fruitless failures? The few rare fertile seeds that were obtained from A. chantinii by M. Sander, at Bruges, and Declercq van Ghyseghem, at Ledeberg, never produced an adult plant that possessed any characteristic that resembled, even from a distance, those of the mother plant. By contrast A. fasciata produces seeds in profusion. A. candida and A. lueddemanniana produce them without even the aid of artificial pollination, and from many other species one can reap a harvest without much difficulty. It is, moreover, not surprising that among the plants that have been propagated from many generations by offshoots that the fertility should be reduced and eventually become sterile. Be that as it may, I took it into my head to attempt to do with aechmeas what others had done with billbergias, nidulariums, and above all vrieseas. I have not regretted my initiative. The first of my hybrids to flower were the Aechmea fulgens discolor. Let us note in passing that the two parents were of distinct species and not varieties of the same species. Indeed, the seed of the A. fulgens were almost double, if not triple, the volume of those of A. fulgens discolor. They were also whiter and of a different shape. The plants were green here, brown there, darker on the under side, more or less, sometimes very pruinose, vigorous, often more robust than the parents. Some of the floral stems measured 50 cm. (20 inches) in height, very strong, well branched, the panicle attaining a height of 24 cm. (10 inches) and more than 15 cm. (6 inches) in breadth, with more than 100 bright red berries. Some of the specimens had berries tinged with black at the top but with none was the stain shown so plainly as with A. fulgens. These novelties produced nothing sensational, but seed were easily obtained and certain specimens showed an exceptional vigor and produced inflorescences that were remarkably developed. These hybrids turned out to be sterile. A. chantinii, from which I had been unable to obtain anything by self-pollination, had given, when pollinated by A. fulgens discolor a series of plants that were remarkable, with leaves of all shades of olive-green to red-brown, and thick and leathery. The plant is of the size of A. fasciata, of elegant appearance though giving the impression of great robustness. The capitulum on the solid stem stands well above the foliage, is densely flowered and more voluminous than that of A. fasciata, and they present quite a gamut of warm and lively coloring, going from canary-yellow to coral-red through orange and salmon. As many as were the plants, so there were as many distinct varieties. I gave these crosses the name of A. × Fulgo-chantinii. In 1939 A. × Fulgo-chantinii luteo-rubens with yellow and red flowers was awarded a Certificate of Merit, First Class. The same honor was also given to A. × Fulgo-chantinii formosa discolor with brown leaves, while the same variety with green leaves had to be content with just certificate, first class. Two other crosses won prizes the same year: A. chantinii aurantiaca of a rich orange color and A. × fulgo-chantinii corallina, a beautiful bright coral-red. A. fasciata, pollinated by A. comata, produced plants noticeably stronger than A. fasciata and of the same appearance, but with less rigid leaves and less boldly marked. The floral stem carries above the leaves a large, conical panicle with bracts of a brighter rose than those of A. fasciata. The flower is very beautiful, but, unfortunately, it is not as long lasting as that of the mother plant, which greatly reduces its interest from a commercial view-point. By pollinating A. candida by A. fulgens I tried to obtain a plant intermediate between these two species, whether it might be with rose-colored flowers or with the appearance of candida with the flowers of fulgens, in short, something new. I obtained only the pure candida. However, from the 300 plants resulting from this crossing, I noticed among those of the first year two specimens which were much more vigorous than the others. After five years of culture (A. candida is a stout plant, but of slower growth, and the lack of coal permitted only a minimum temperature in the greenhouse) the plants flowered, and my two "pets" of which the increase in size was double of that of their brothers, produced, like them, white flowers, but in a panicle much larger and with pure white berries that were much more voluminous. To sum up, it was a good acquisition that formed an intermediate between A. candida and A. leucocarpa, however, closer to the former. I believe that if one desired to recreate the species, or something approaching it, one could do so more easily by crossing one with the other, using both candida and leucocarpa, for I believe that the pollination by A. fulgens was useless in the case of the gigantism presented by the A. candida major that has unhappily disappeared. A. fulgens discolor by A. weilbachii and by weilbachii leodiensis as with A. lamarchei, produced nothing outstanding, nor even equal to the parents. By contrast, A. fulgens pollinated by A. ramosa, alias Reukartians, produced hybrids stronger than the mother plant, with green leaves in some and brown in others, with large upright, abundantly branched flower panicles, followed by orange-yellow berries of the size of small peas and very long lasting. The two varieties were displayed at a meeting on August 6, 1939, under the names of A. × fulgo-ramosa and A. fulgo-ramosa discolor. Both were awarded a Certificate, First Class. The inverse crossing, A. ramosa being the seed carrier, produced very strong plants with short leaves, but broader than those of A. ramosa, and with a less voluminous panicle. A. recurvata var. recurvata × A. fulgens discolor gave me small plants with green leaves tinged with brown, narrow, more or less long, as with the parents. One of them reminded me of Tillandsia lindenii, but with fine spines. Of a beautiful, brilliant, clear green, delicately but clearly edged with brown, they were brown on the underside. The inflorescence, less developed and less brilliant, added nothing to its decorative value. It was nonetheless, a handsome plant, excellent for baskets and logs. I designated it as A. × Ortgiesioides, a name under which it obtained a Certificate of Merit as a foliage plant. This same A. × Ortgiesioides was in its turn pollinated by A. calyculata, by A. fulgens discolor, and by A. fasciata. The results from these crossings were a series of plants of small size, well proportioned, some with narrow leaves, the majority having a width of 3-4 cm. (1¼ -1½ inches), stiff, some green, others brownish or brown, more or less fasciated, chiefly on the reverse side. The floral stem was, in the majority of them, shorter than the leaves. With others the capitulums were elevated above the foliage; the ovaries, generally, were yellow, rarely rose, with red bracts, as with A. calyculata. The petals were in all shades — lemon-yellow, golden yellow, soft rose, bright rose, orange, sky-blue, lavender-blue, dark blue, violet, and even a curious aqua-green. Among them were some extremely pretty miniatures. I could have easily selected fifty varieties, all distinctly different, but I kept for propagation purposes only a dozen, quite varied and distinct. The plant had flowered in 1943; I had pollinated some, for many were fertile. But of all that I had produced, the most remarkable were, indubitably, those from the crossing of A. chantinii and A. fasciata. The plant is noticeably stronger and more robust than fasciata, of which it has the appearance, with leaves from 59-60 cm. (20 to 24 inches) long, and 8 cm (3½ inches) or more wide, solid without stiffness, farinose, and ribboned with white on the upperside; it gives the impression of having great vigor. The floral stem is very solid and upright, elevated well above the leaves, and bears a large, conical panicle, wide at the base, more than 20 cm. (8 inches) with long bracts of a beautiful salmon red, recalling the beautiful bracts of A. chantinii. The only plant I had the opportunity to see in flower in the autumn of 1942 remained beautiful until the summer of 1943. All of the others like it that I had possessed perished in 1944, victims of the war. Androlepis skinneri crossed by A fasciata and by A. fulgens discolor give to the plants a special effect — to some, green leaves, to others bronze foliage, the first probably from the pollen of fasciata, the other from that of fulgens discolor. Because of their bi-generic origin, I gave these newcomers the name of Androlaechmea, which unites those of the two parents. One of them was particularly vigorous, 40 cm. (16 inches) in height, with an almost equal breadth. It had green leaves, lightly farinose and striped, having a width of 8 cm. (3¼ inches), leathery, upright, and compressed into a tube for two-third of their length, then curved downward, simulating thus a large vase from which comes the specific name of crateriformis, which I gave to it. The inflorescence is very close to that of A. fasciata, but of darker rose that glows brightly, standing clear of the foliage, on a stout rigid stem. The general aspect of the plant was so special that I left my temporary seclusion in order to exhibit it at a meeting on July 4, 1943, where, under the name Androlaechmea crateriformis, it was awarded a Certificate of Merit, First Class. Some specimens of it still exist at the L'Ecole d'Horticulture at Melle. One could name them Androlaechmea subcrateriformis for those with green leaves, and Androlaechmea cenea for those with bronze leaves. The hybrids of billbergias are very numerous. Bellair and Saint-Leger, in Les Plantes de Serre, have mentioned about fifteen. Certain ones are of great beauty, but the short duration of their flowers takes away much of their interest. Personally, I have attempted only one hybridization: B. saundersii × B. pyramidalis, and inversely, in the vague hope of uniting in a single plant the beautiful flower of the second and the beautiful foliage of the first. Result: Although vividly splotched with oval spots and areas of white, the foliage of the hybrids was much less striking than that of B. saundersii, and the pendant flower was also less brilliant. The plants could be utilized, but I did not attempt to multiply them. It is with great pleasure that we announce the opening of the Bromeliad Identification Center on January 2, 1979, at The Marie Selby Botanical Gardens, 800 South Palm Avenue, Sarasota, Florida 33577. For each plant to be identified, please submit the plant with inflorescence and $5.00 to cover costs. The plant will not be returned. See next issue for full details. The five major plant hormones are auxins, cytokinins, gibberellins, abscisic acid and ethylene. The latter is by far the simplest of all in chemical structure, since it has two carbon and four hydrogen atoms. It is the only phytohormone which is a gas. It is effective at remarkably low concentrations at a threshold value of about 0.01 parts per million. The saturation point is about 10 parts per million, but overdoses are not usually particularly injurious. Ethylene is the first in the ethylene series of homologous hydrocarbons. It is very soluble in lipids, the fatty substances of plants. Some unusual responses of plants to the ethylene in the coal gas used for domestic purposes in some areas were noticed early in the present century. Over fifty years ago several scientists at the Boyce Thompson Institute for Plant Research found that ethylene promoted the ripening of fruits and later found that it caused unusual movements of leaves and promoted root formation on herbaceous plants. These scientists were also the first to point out that ethylene is a true plant hormone by all the usual criteria. The Chinese knew long ago that the burning of incense in a room hastened the ripening of fruits. Ethylene is a by-product of incomplete combustion and long ago wood fires were sometimes used in pineapple fields to promote flowering and fruiting. Similar treatments were sometimes given to mango orchards. Bromeliads came early into ethylene research. Acetylene also induces flowering of bromeliads and sometimes a small piece of calcium carbide was placed in the leaf tank water of a bromeliad to induce flowering. However, because of the local injury, this treatment was little used. It was also found that tilting pineapple plants sideways or spraying them with auxins would also induce flowering. In both these instances, the flowering is believed to be due to the enhanced local formation of ethylene by these treatments. Since gases are somewhat difficult to meter and to apply, much use was made of compounds which could be applied in aqueous solutions and which would release ethylene. Ethylene chlorhydrin was much used to break dormancy in bulbs and corms, especially with gladiolus. Ethephon has been much used for horticultural purposes. This is abbreviated as CEPA (2 chloroethane phosphonic acid). This compound is stable in aqueous solutions at a pH below 4.0 but above this, it breaks down, forming ethylene. It is excellent for inducing premature flowering of bromeliads. It will also change male flowers of the cucurbits to female and has been used practically in plant breeding and seed production. Ethylene seems to be a part of a naturally occurring control mechanism in plants, having both inhibitory and stimulatory effects on plant processes. It promotes abscission of leaves, flowers and fruits, hastens senescence and ripening, produces some abnormal leaf and stem movements and can promote swelling of certain parts. Ethylene can interfere with the effect of gravitation on root directional growth. It breaks dormancy of buds, corms and tubers, but can also suppress bud development. It can promote flowering in a very few plants such as bromeliads, mango and apple. Ethylene promotes sap exudation and is used as an aid in the tapping of rubber trees to stimulate the flow of latex. Obviously ethylene is a very important factor in the internal regulatory mechanisms of plants. The ethylene produced in plants has the amino acid, methionine, as a precursor. An oxidative process is involved in its formation. Auxins apparently stimulate ethylene formation by increasing the amounts of certain enzymes in the plants. Some responses which have been attributed to auxins may actually be due to ethylene. The mechanism of the action of auxins and ethylene is not fully understood at the present time. Ethylene is produced in various portions of the plant including the flowers. This has been a problem in the long distance shipment of some flowers, especially carnations, where it induces "sleepiness" and partial closure, thus causing considerable losses. Ethylene is particularly destructive to orchid flowers and some commercial glasshouses near lanes of heavy motor traffic have often suffered considerable damage. Some chemicals have been found, particularly silver salts, which antagonize the action of ethylene. Apparently ethylene in the plant is finally oxidized to carbon dioxide as an end product. The great practical importance of handling and storage of fruits and vegetables led to well financed studies in post-harvest physiology. Vegetables, fruits and flowers produce ethylene as a natural process involved in maturation or ripening and also senescence. The ethylene is in turn an accelerator of these processes. Much of this investigational work was done in the USA or in the British Empire. Ethylene has long been used to ripen those fruits and vegetables which are always harvested and shipped in an immature stage, such as bananas and tomatoes. Unwanted production of ethylene from a certain mold of stored citrus fruits, Pennicilium digitatum, has given much trouble with premature ripening. Ventilation systems with scrubbing of the air to remove the ethylene was a solution. This was an important development from studies in post-harvest physiology. More attention is being given to ethylene by plant physiologists than ever before. New techniques, such as gas chromatography, have aided progress greatly. Many popular bromeliads are a little large for some interiors or for supermarket or retail nursery sales. We have sometimes seen half-sized plant of Aechmea fasciata offered for sale. This is an instance in which premature flowering is used to reduce the size of bromeliads at maturity. Amateur growers have sometimes placed a ripe apple in a plastic bag with a bromeliad plant for about a week to induce early flowering with the ethylene produced by the apple. When ethephon became available, the writer treated some of his own plants with it. We did obtain early flowering, but we did not like the after effects. We now allow all bromeliads to bloom when they reach full maturity. We have always propagated a sufficient number of such plants as Aechmea fasciata each year so that we can count on having adequate numbers of plants in bloom in their natural season. We would not purchase a prematurely flowered bromeliad for our own plant collections and we suggest that amateur growers do not try to induce flowering chemically. Although we discourage chemically induced flowering for the hobby grower, there is doubtless a place for such treatments in the production of flowering bromeliads for mass markets as pot plants. Early experiments were with acetylene gas and with Omaflora (beta-hydroxyethyl hydrazine) and were conducted mostly in Belgium, Holland and the USA. Most of the more recent research has been done with formulations of ethephon (2 chloroethyl phosphonic acid). The present recommendations for spraying stem from the experiments of Vanluchene (1969), Besemer and Furuta (1970) and Cathey and Taylor (1970). Vanluchene used Neoregelia, Aechmea. Vriesea and Tillandsia. Cathey and Taylor used the same plants, except that Ananas was substituted for the Tillandsia. Besemer and Furuta used 12 and 14 month old plants of Aechmea fasciata and obtained excellent flowering without injurious effects. Plants for treatment should be grown under a photoperiod which promotes vegetative growth. This will be long day for Ananas, Billbergia and Neoregelia. Short days will be needed for Aechmea and Vriesea. Water should be removed from the tanks and algae should also be removed if present, and the water should not be replaced until 24 hours after the treatment. No fertilizers should be applied for two weeks before or after spraying. A night temperature of 65° to 70°F. should be maintained during the period of treatment. Several formulations of ethephon are manufactured by Amchem Products, Inc., Ambler, Pennsylvania. For pineapples, to induce flower bud initiation and to promote good coloration of the fruit shell a formulation (Ethrel) is available containing 39.5 per cent of ethephon (2 chloroethyl phosphonic acid). Florel Plant Growth Regulator is used for the ornamental bromeliads and this formulation contains 3.9 per cent ethephon. For most bromeliads, 8 fluid ounces of Florel is used per gallon of water, which gives a spray with approximately 2500 ppm of ethephon. This spray is not stable and should be used within 4 hours after mixing. One half pint of the mixed spray will cover the plants in 10 square feet of glasshouse or outdoor plant bed. Overspraying should be avoided. Recently, Adriansen (1976) in Denmark found that ethephon was preferable to gaseous treatments in the glasshouse. Ethephon sprays at 0.05, 0.10, 0.15, 0.20 and 0.25 per cent were effective. Spraying in spring and summer was preferable to spraying in the fall or winter. Spraying on May 4th or August 13th produced flowering of Guzmania, Vriesea, Tillandsia, and all but the very smallest sizes of Aechmea. Flowering occurred in the range of the following number of days after spraying: Aechmea, 59-69, Guzmania, 37-40, Vriesea, 105-120, and Tillandsia, 125-145. Adriansen, E. 1976. Tidskrift for Pleavi. 80 (6): 857-868. cited in Horticultural Abstracts 1978. 48 (5): 418. Besemer, Seward T. and Tokuji Furuta. 1970. Flowering of Aechmea fasciata with ethrel. Florists Review 145 (3761): 18-39, 40. Cathey, H. M. and R. L. Taylor. 1970. Flowering of bromeliads with spray applications of 2-chloroethane phosphonic acid (Ethrel). Florists' Review 146 (3790): 38-39, 82-86. Vanluchene, I. 1969. Nieuwe Bloeiinduktiemetode Bij Bromeliaceae. Mededeling. Ministerie van Landbouw, Centrum voor landbouwkundig Onderzoek-Gent. 17: 1-21. AECHMEA MILSTEINIANA L. B. Smith & R. W. Read, spec. nov.
A Ae. fosteriana L. B. Smith, cui affinis, foliorum laminis concoloribus, inflorescentia bipinnata, rhachidi flexuosa differt. Leaves green, about 10 in a somewhat erect tubular rosette, the inner ca. 45 cm long, densely lepidote with pale brown-centered appressed scales; sheath ovate-elliptic, to 18 cm long; blade ligulate, broadly rounded and apiculate, 6 cm wide, laxly serrate with straight subspreading spines to 1.5 mm long, the outer leaves much smaller with more tapering blades and flat spines to 5 mm long. Scape slender, arching, greatly exceeding the leaves, laxly vestite with appressed, white scales; scape-bracts tubular-erect, narrow, apiculate, 9-11 cm long, rose, sparsely white-lepidote. Inflorescence broadly pyramidal, laxly bipinnate, 14 cm long, laxly white-cobwebby; lowest primary bract like the scape-bracts, the others rapidly reduced; spikes subspreading, to 5 cm long, laxly polystichous, few-flowered; rhachis slender, flexuous. Floral bracts broadly ovate, acute and apiculate, 8 mm long, about equaling the ovary, thin, prominently nerved; flowers sessile. Sepals nearly free, strongly asymmetric with the broad wing overtopping the apex, suboblong, 10 mm long, green to chartreuse apically; the soft apical mucro 0.5 mm long, petals yellow, 18 mm long, bearing 2 lacerate scales at base, blades elliptic, ovary ellipsoid, epigynous tube shallowly crateriform; placenta extending nearly the length of the cell; ovules obtuse. TYPE: Cultivated, 14 June 1978, R. W. Read 3659 (US); flowered 15 June 1978. 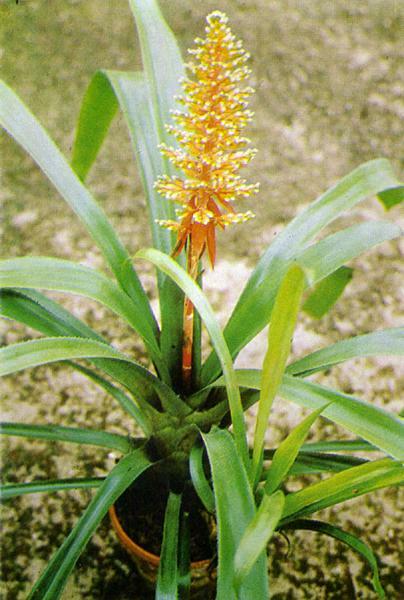 Aechmea milsteiniana is more closely related to Ae. fosteriana than to any other known species but is readily distinguishable by its evenly green leaf-blades, bipinnate inflorescence, and flexuous rather than geniculate rhachis. This affinity would indicate that Ae. milsteiniana is probably native to eastern Brazil since Ae. fosteriana is from the state of Espirito Santo. Plants of Ae. milsteiniana are in cultivation under the name of Ae. bambusoides, a species with a much different habit. Cardenas. Martin. 1969. Disertaciones Botanicas y Amenidades Biologicas. Editorial "Los Amigos del Libro". La Paz. Bolivia. Cardenas, Martin. 1973. Memorias de un Naturalista. Editorial Don Bosco, La Paz, Bolivia. Dorst. Jean, 1967. South America and Central America. a Natural History. Random House, New York. Herzog, Theodor. 1923. Die Pflanzenwelt der Bolivischen Anden. Leipzig, Germany. Harms, H. 1928. Notizbl. Bot. Gart. Berlin, Germany. Kinzl, Hans. 1949. Die Puya Raimondii, ein Wahrzeichn der Tropischen Anden. Jahrbuch der Osterreichischen Alpenvereiis. Austria. *The term wing is often used to denote the outer ring of cells in the Tillandsioideae scale. Butcher, Dennis N. and David S. Ingraham. 1976. Studies in Plant Tissue Culture. Published by Edward Arnold in England. Distributed in the U.S.A. by Crane Russak and Co., Inc., 347 Madison Avenue, New York, New York 10017. This inexpensive paperback of 68 pages has been urgently needed for some time. Several hard cover and paperbacks on plant tissue are available in English from a number of countries. Some are excellent and present the latest developments in the field in a highly technical or theoretical manner. They are all useful in one way or another to the specialist, but none has described the basic manipulations and apparatus adequately and clearly enough to be useful to those who do not have laboratory experience in bacteriology or plant pathology. This book will be particularly useful to those interested in the propagation of plants by means of tissue cultures. On a bromeliad collection trip which I made in 1973 to Ecuador, I found an aechmea which was new to me. 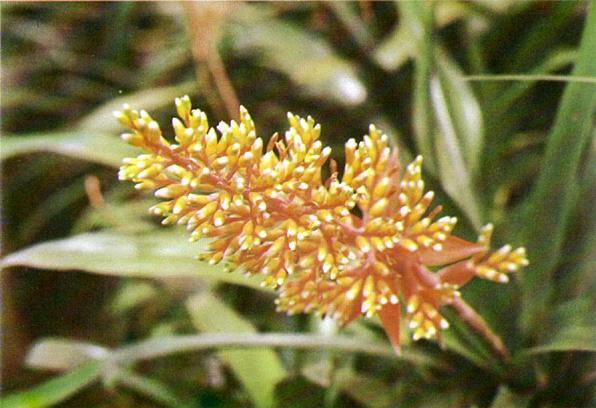 I found this plant in Lago Agrio in the province Napo at an elevation of about 400m. The road to Lago Agrio was only a few years old, since oil had just been found in this area and a road was needed and a pipeline built to transport the oil out of the Amazon basin over the Andes to the harbors on the Pacific. Since this road was just a few years old, there was a possibility that undiscovered bromeliads would be growing here. In Lago Agrio, in a little woods, I found a plant of the new aechmea growing epiphytically. The plant was in full bloom. After the bloom, in our nursery, the plant produced white berries which subsequently turned blue. I discovered that the plant had set seed. Since 1973 I have brought two generations of this aechmea into bloom and from hundreds of plants have selected those that were the most beautiful in growth habit and bloom. Until today Professor Rauh has not been able to determine whether this plant is a new species or one that has already been described. 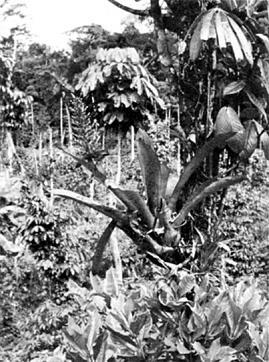 The first plant taken in habitat in Ecuador, 1973. The culture of Aechmea species "Ecuador"
The culture of the new aechmea is rather simple. From sowing to bloom the plants take 18 to 21 months. One should cultivate them in rather bright light (as for Aechmea fasciata) and avoid crowding the plants right from the beginning so that the leaves will not become too long and soft. By fertilizing regularly, one can get strong plants capable of good bloom. The natural bloom period in Germany is in the summer during the months of June to August. When the plants are large enough, however, one can successfully treat them with acetylene gas. From bloom to the setting of berries takes approximately half a year. Thus it is a very long-lasting plant. After bloom, the plant develops numerous pups, which are of bloom size in about half a year. Somewhere in the Journal, someone described their local bromeliad show. I was quite put off by their obvious pleasure in reporting that no one exhibited common plants such as Billbergia nutans. It appeared to me as a kind of snobbery that offended me. Perhaps I have no taste, but a well grown bromeliad, however common, is a pleasure to me. Further, my first bromeliad was this "Friendship Plant" and it occupies a soft spot with me. It endures my abuse as well as it relishes my care. It tolerates me in a cat-like way. I give it to friends and it thrives. I like it and refuse to be ashamed of it. 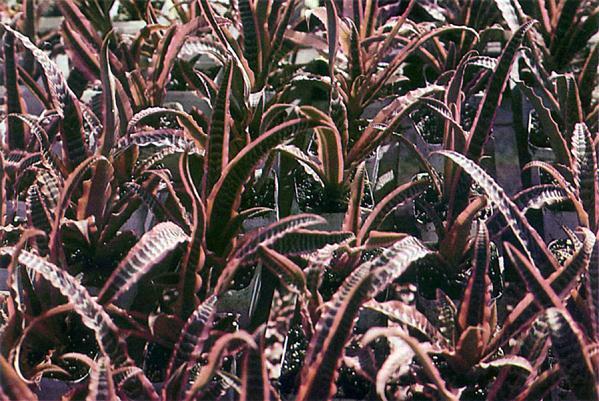 Some complaints have been received in regard to the rules for naming hybrid bromeliads for registration. The principal complaint concerns the requirement that all individual plants resulting from a cross have the same registered name. A problem arises upon trying to obtain a plant exactly like a plant or a picture which has been seen. The variability of seedlings is well known. This is true of species as well as hybrids. 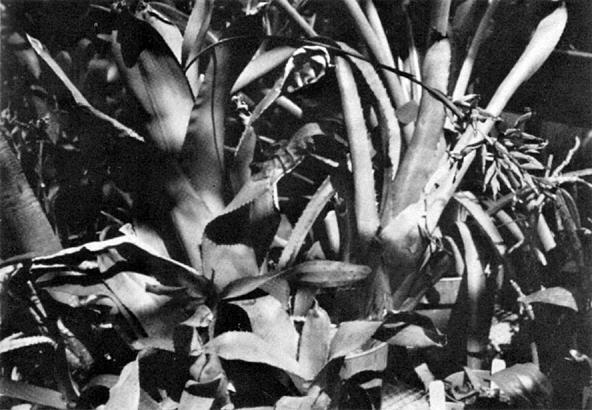 An example is the beautiful Neoregelia pabstii shown on page 104 of the May-June 1978 Journal. If a plant were ordered by this species name only, a disappointing plain green variety could be received. Each seedling from a cross can develop into one differing in some way from any other seedling from that cross. Therefore an exact duplicate of a specific plant must be a vegetative division of that plant, such as an offset or "pup". For such a duplicate to be obtained, the specific plant must be described in more detail than its registered name. Customarily a grower, commercial or private, will give an outstanding individual plant a varietal name. If a varietal name has not been given, some other means of identification must be used, such as color, shape, etc. If some grower has obtained sufficient offsets of the desired variety, it can be obtained from that grower. Should this variety be from a newly made cross, possibly no plants may be available for a long time. In any case the buyer must describe exactly what is wanted and seek a source for it. The purpose of registration is to record the crosses that have been made and to identify their parentage back to the species involved, wherever possible. Such information is valuable to serious collectors, hobbyists and private growers as well as to hybridizers. Much insight can be gained as to the type of hybrids which can be produced from certain parents, but there is no way that a specific variety can be deliberately duplicated. Obviously the registration of all varieties of seedlings is practically impossible. However, experience with suppliers of plants has shown that varietal names have, in most instances, been respected. Registration is not intended to produce either a sales catalogue or a buyers guide. 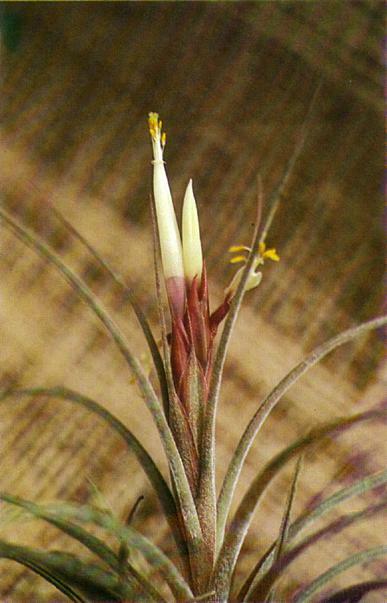 This attractive tillandsia hybrid is the result of crossing Tillandsia ionantha and Tillandsia schiedeana. I used the T. schiedeana as the capsule parent and the T. ionantha as the pollen donor. The cross was made in early February, 1973, and the seed was sown nearly a year later in January, 1974. I placed the seed up and down on an oak log in the greenhouse that already housed a clump of T. ionantha and lowered it from a high bright position to a shadier and more humid one. This is also where I grow my T. stricta to give you some idea of the surrounding microclimate. Within two weeks the majority of the seeds had germinated and started to grow fast and well. For the next two years the seedlings were given no special care. They were watered only when the entire greenhouse was watered and I doubt they were fertilized more than three or four times. In the fall of 1977 while moving plants into the greenhouse for the winter I shifted the oak log and inspected the seedlings. Most of them were about two inches tall with a few stragglers but also a few very robust plants. These larger plants were coming into bloom at a little less than three years of age! Seeing this I immediately hung the log up high to try to obtain maximum bract color in the better light. The plants colored up very well, and by spring of 1978 the majority of the plants had bloomed. In optimum light the blooming plant is quite striking. The lower three-fourths stays silver-green while the upper fourth turns a warm scarlet-orange. The petal color is predominantly a rich yellow with a pale lavender flush around the base. The bract lasts in color three to six weeks depending on light quality and humidity. It is with great pleasure and sincere admiration that I name my first bromeliad hybrid after John D. Staub, MD, of Houston, Texas. A naturalist of great ability and some persuasion, he has a keen interest in the botany, ornithology and anthropology of the American Tropics. He is a most out-going personality and can bring out the best of the "local color" in any village. A trip to Mexico with him is a truly unforgettable experience, as those will attest who have survived them! The Journal is mailed the third week of January, March, May, July, September, and November. It takes from 3 to 6 weeks for the Journal to be delivered to the various parts of the United States. All members who contemplate a change of address are urged to send in their new address at least four weeks before the Journal is mailed. Address: The Bromeliad Society, P. O. Box 41261, Los Angeles, California 90041. Bromeliad lovers now have the opportunity of having the most extensive color photo collection yet published in Dr. A. B. Graf's new book Tropica. In this volume of 7,000 pictures, 310 are devoted to bromeliads. As a companion to Exotica, the new Tropica competes with the Sears & Roebuck catalogue as the "wish book" of plant lovers. In addition to its basic reference value the numerous photos shown in habitat help the grower to have more information in selecting the best place for his plants. There are also 2,300 plants in Tropica that do not appear in Exotica 3. Tropica follows the same general scheme as Exotica with preliminary text, photos, descriptive material and index. About 30 pages of text introduce the subject of tropical and subtropical horticulture. Very helpful is some specific information about temperature ranges in these regions. Also related to this are rainfall characteristics and the subsequent effect on soils. Maps and charts aid one to visualize better the geographical areas discussed. The photos, of course, make up the mass of the book and there are almost 900 pages of them. Many are of the botanical textbook variety but wisely interspersed are pictures in endemic areas or showing an interesting use of a plant somewhere in the world. For those who live in subtropical regions the book becomes a guide to all the possibilities of plants for their gardens. A helpful text describes the vast amount of material that can be used in the warm climate garden. Dr. Graf makes the point that the best gardens appear in the subtropical zones rather than tropical because lush growth is taken for granted in the tropics, and elsewhere the gardener must take more care. Examples cited are in the gardens of the Mogul Emperors and the ancient Roman villas. There are several very useful pages to assist the gardener in choosing the best plants for specific situations. As one ventures through the book the eye is charmed by the enormous variety and beauty of tropical flora. Even the traveler can get a mini plant geography lesson from browsing through the book. Whether you are a greenhouse gardener, a patio gardener, or the back yard species, Tropica has valuable information and is a guide to easy identification of plants. Whatever your interest Tropica will become an important and valued addition to your plant library. The fact that bromeliads are grown in so many countries with all possible variations in climate is proof enough that their reputation for adaptability is well justified. As a general rule, the principal factor referred to in these climatic variations is temperature. There are lists of plants which are supposed to be hardy and of others which are not, with the minimum temperature required by the plants. Rather less attention has been given to the other variations in the weather and their effect on bromeliad growth and flowering. There is, I think, need for more research into these problems. Many plants seldom flower in our greenhouses or gardens. Is this a natural feature of these plants in their habitat or is it due to some difference in the climate to which they have been transferred? What is the effect of growing a high altitude plant at sea level and vice versa? Many such queries suggest themselves, and it is only rarely that one finds an article dealing with these subjects. It must be bewildering to a plant accustomed to growing in the tropics, with little difference between the length of day and night to be transferred to a high latitude where the difference is considerable for much of the year. A glasshouse can supply the required temperature but cannot compensate for the short day when the hours of daylight may be insufficient to allow for maximum growth. The artificial climate in a glasshouse may differ in a number of ways from a more natural climate; the proportion of carbon dioxide and other gases liberated by the plants must be higher in an enclosure such as in a glasshouse than it would be in the open air. There is also the fact that the light may differ from normal daylight. Fortunately the light frequencies essential to growth comprising red light and blue light pass freely through clear glass. It is now always realized that green light is of almost no value to the plants at all, as we see from the fact that this light is reflected, giving the plants their green color. However, light of a higher frequency that of the visible spectrum, the so-called ultraviolet light, is not transmitted through ordinary glass. This used to be considered a disadvantage, but the fact that such a variety of plants can be grown and flowered successfully under glass suggested that this high frequency radiation is not essential. It is difficult to judge whether plants grow better under glass than in the open, but it does seem that a few species growing here flower more freely in the open. The effects, if any, of abnormal seasons are also difficult to assess. There used to be a belief in England that a heavy crop of berries on holly, hawthorn, and similar subjects was a sign that the winter would be unusually cold. I don't believe any form of plant can foretell the future in this manner. The summer and autumn of 1978 were, in this part of Australia, unusually hot with the temperature during late autumn being above average. This produced some curious results, trees such as the jacaranda, growing new leaves in the autumn instead of the following spring. Various bulbs were affected too, the early varieties of daffodil flowering freely in midwinter. There are a number of bromeliads growing in the open here, and I think many of them benefited from the longer growing season. As usual, the billbergias flowered well during the winter. They seem to do so under any conditions so the long hot summer apparently had little effect on them. We had to pay for the early season with some really vile weather in July, frequent hailstorms and continuous cold, but this has not had any harmful effect on most of the bromeliads. It would seem that in general the bromeliads can adapt to almost any variations in climate without any great alteration in their normal season growth habits. In this district, at any rate, it is noticeable that many plants make new roots in the autumn. The neoregelias are an example of this. If offsets are removed in summer they may remain dormant until the days are shorter and cooler. For several years our summers in this part of Australia have been unusually dry, and at times the bromeliads growing in the garden have received no water for several weeks. This has not had any harmful effect on the plants provided they are not exposed to too much sun. On the other hand, in a wet winter the plants may find themselves growing in waterlogged ground for a week or two, again without any apparent damage in most cases. However, continuous cold wet weather does at times cause some deterioration in the less hardy varieties. The dyckias are not so tolerant of cold wet conditions as most other terrestrials. It should be mentioned that it is very unusual for plants in my garden to be subjected to frost, so I am not able to tell which species are able to withstand frosts. Temperatures down to freezing point are not uncommon, but this is not the same as actual frost when the leaves may be frozen solid. The generally tough nature of the leaves also enables the plants to withstand strong winds which would blow other plants to pieces. Perched high in cypress trees, or on rocky cliffs, along river-banks in the state of Michoacan in central Mexico, at elevations between 5,500 and 6,000 feet, Tillandsia dugseii is a colorful component of the riparian community. We first discovered this plant during the summer of 1975 and admired it for the stately form of the many-leafed rosettes growing on green-clothed cypress branches overhanging a rapidly flowing stream. In December of 1977, we revisited the same location and were again captured by this Tillandsia but this time the brilliant red spikes with intense, blue-violet flowers, against a background of burnt-orange and gold cypress foliage, created an entirely different mood. Dr. Smith, in part 2 of his monograph, lists collections of this species also from the states of Guanajuato, Puebla, and Mexico, as well as Michoacan, where it is epiphytic in pine or mixed woods, at altitudes from 400 to 3,000 meters (about 1,300 to 9,840 feet). While admiring and photographing the plants, I was fortunate to observe a humming-bird visiting one of the plants which was perched about 30 feet above the river. I had seen humming-birds visit tillandsias in the past and my experience on the previous occasions has been, being in the right place, at the right time, with the wrong equipment to get photographs of this pollinator. This time was no exception. I was, however, carrying my camera ready to shoot, but with a lens too small for the distance. In cultivation, our experience has shown that this species is adaptable to low elevations. Unfortunately the inflorescences developed under our growing conditions lack the brilliant color we so admired in its habitat. The introduction of a new variegated bromeliad never fails to create widespread interest among those growers who like to see their favorite plants striped or mottled in a way that deviates from the norm. Such is now the case with the newly introduced Cryptanthus fosterianus 'Elaine.' When C. fosterianus first entered the bromeliad scene a number of years ago, it created a sensation equal to none. Now this variegated form makes it appearance and immediately has become a highly desired item. The beautiful pheasant feather-like foliage is enhanced by a border about ½ inch wide of the most vivid shocking pink. The leaves are approximately 2 inches wide and 12 to 16 inches long and tend to grow upright rather than flat as does C. fosterianus. It is a vigorous grower but needs strong light to maintain its brilliant coloration. This cryptanthus was developed by Cobia Nursery in Winter Garden, Florida over a period of nine years. 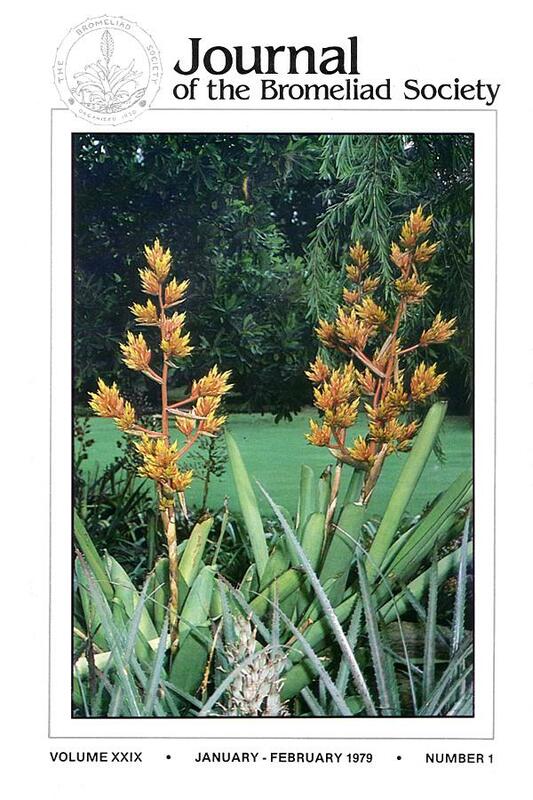 It is being distributed by Exotic Bromeliads, Lakeland, Florida, and by Kerry's Nursery, Homestead, Florida.